Mónica Antilén1, Mauricio Escudey*1, Juan E. Förster1, Nelson Moraga2, Denis Marty3 and Olivier Fudym2, 3. Ecole des Mines d'Albi, France. The thermal properties of soils, as thermal conductivity, have been usually determined by different designs of the quasi-permanent hot wire method. In the present paper the hot disk method was used to determine the effective thermal diffusivity (ETD) and thermal conductivity (TC) of soils derived from volcanic materials (one Ultisol and two Andisols) as a function of temperature from 25C to 280C. The volumetric heat capacity was also calculated from ETD and TC estimations. The TC values at 25C ranges from 0.84-0.94 for Andisols to 1.27 Wm-1K-1 for the Ultisol, and are similar to those reported by the hot-wire method. Values decrease down to 0.28-0.32 for Andisols and 0.67 Wm-1K-1 for Ultisol when heating temperature increases from 25C to 280C. The TC increases when soil density or water content increases, and decreases when soil organic matter content increases. The values of the thermal properties depend on water and organic carbon content, and mineralogy of samples. The effective thermal properties of soils are of great importance for agronomy and engineering areas. The knowledge of thermal properties, such as thermal conductivity, and its variation with the temperature, permit the description of heat transfer processes, in activities such as cold zones building and installation of underground cables (1). These properties also play an important role in plant physiology (2), and in studies related to climate changes (3). Soil thermal conductivity depends on structural factors such as porosity, density, pore size distribution, mineralogical composition, water content and management of soils. It has been pointed out by Abu-Hamdeh and Reeder (3) that the effective thermal conductivity value is related with the soil water content, the relationship is characteristic for each soil and must be experimentally determined (4, 5). The thermal properties have been studied from mathematical and physical points of view, including mathematical models to describe the temperature gradient in porous media (6, 7, 8). Different designs of the rapid and convenient quasi-permanent hot wire method (9), where the soil temperature is time dependent, have been used to determine thermal conductivity or diffusivity in soils (4, 10, 11, 12, 13). The hot disk, which is also a transient method, has not been used in thermal characterization of soils. Thus, the aim of the present work is to describe the use of the hot disk method to determine the effective thermal properties, as a function of temperature, of Chilean soils derived from volcanic materials. The hot disk is a Transient Plane Source method (TPS), which is suitable to measure thermal conductivity and thermal diffusivity in both insulating and diffusive materials (14, 15). The heating probe is made of a thin foiled calibrated Nickel resistance used both to heat the sample and to measure its temperature evolution. An electric generator supplies a step power excitation to the probe. 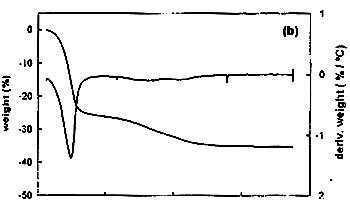 The sample is assumed to be semi-infinite in both radial and axial ways. The characteristic time of each experiment is chosen in order to fit with this hypothesis, relative to the size of sample and the radius of the probe. The effective thermal diffusivity is estimated from a linear expression of the function f(t) in Eq. (1), where P0 is the output power, t is the relative Fourier number to the sample and r the probe radius (14, 15). Equation (1) gives a relationship between the dimensionaless time and the probe temperature history. The thermal conductivity is then obtained from Eq. (1) through a linear regression. The solution given by Eq. 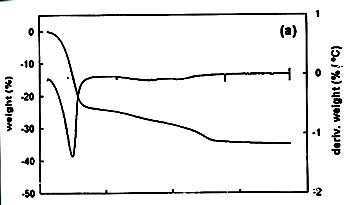 (1) is obtained considering that the Nickel resistance is made of ten concentric annular sources. The volumetric heat capacity is deduced from the thermal conductivity and diffusivity estimation. Samples were collected from the A horizon of three Chilean pedosystems, an Ultisol (Collipulli, old volcanic ashes), and two Andisols (Ralun, recent volcanic ashes, and Diguillin, modern volcanic ashes). All samples were air-dried for 24 hours and sieved to 2mm. Soils samples were characterized for organic carbon content determined by the Walkley-Black method, water content determined by weight loss at 105C, and bulk density determined by the core method (16). A full characterization of soil samples and methods description can be found in Escudey et al. (17). Thermogravimetric analysis were performed in a Setaram TG-DSC 111, using approximately 50 mg of sample at an ascending heating rate of 5C per minute under air atmosphere from 25C to 750C. The effective thermal properties values were determined by the hot disk method. The equipment was provided with an electric resistance measurement (Sourcemeter 2400 Keithley), a natural convection airflow oven (Heraeus model T6060), and a data program for thermal diffusivity (a, m2s-1) and thermal conductivity estimation (k, Wm-1K-1) which allows to calculate the volumetric heat capacity (rc, Jm-3K-1). The hot disk measurements were performed filling two identical crucibles of 10 mL of capacity, at the soil bulk density; immediately the probe was placed between the two samples; then, the containers and the probe were placed into the oven, within an homogeneous thermal screen. The thermal properties were determined at 25°C, 100C, 200C and 280C. After a 12 hours of equilibrating time, to ensure the desired temperature, at least three measurements were performed every 30 minutes at each temperature. The Ultisol sample (Collipulli) is characterized by a higher bulk density, and lower organic carbon content than Andisols (Diguillin and Ralun). The Collipulli air-dried sample presents a lower water content (23.2 wt. %) than Diguillin (30.1 wt. %) and Ralun (33.7 wt. %). Bulk density, organic carbon content, and thermal properties of soil samples are given in Table 1. 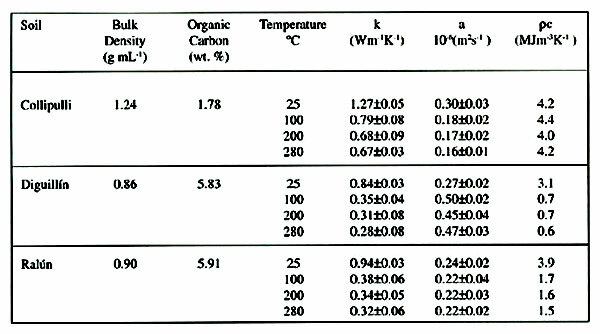 Table 1.- Soil samples bulk density, organic carbon content, and effect of temperature on thermal conductivity (k) determined by the hot disk method, and on thermal diffusivity (a) estimated by equation (1), and on the calculated volumetric heat capacity (rc). 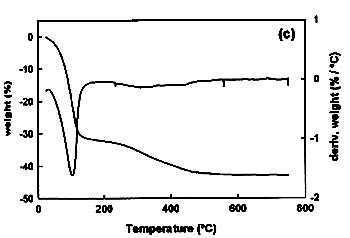 Samples lost between 35% (Collipulli and Diguillin) to 42% (Ralun) of the initial weight when temperature changed from 25C to 750C, determined by thermogravimetric (TG) and differential thermogravimetric (DTG) analysis (Figure 1). The most important weight change occurs between 25C and 105C, which is associated to the loss of the water content of each sample. From 105C to 280C only 2-3% of weight loss is detected (Figure 1), associated to dehydration of organic matter and inorganic compounds, and dehydroxilation of inorganic compounds. A full description of soil changes with temperature can be found in Escudey et al. (18). Fig. 1 The TG and DTG curves for Collipulli (a), Diguillín (b) and Ralún (c) samples. The thermal conductivity of air-dried samples measured at 25C by the hot disk method ranges from 0.84 to 1.27 Wm-1K-1, these values are similar to those obtained by the hot-wire method (3, 12) for non-volcanic soils. The thermal conductivity of volcanic soils increases when soil density increases, as has been as previously observed in other soils (3). The thermal conductivity decreases rapidly from 25C to 100C and slightly from 100C to 280C (Table 1), this behavior is associated to samples changes with temperature detected by thermogravimetric analysis. The thermal conductivity decreases when water content decreases (3, 12) being more important between 25C and 100C. These behavior shows the importance of the water content in the heat transfer mechanism of these soils, due to evapocondensation contributions. A similar thermal conductivity value (about 0.3 Wm-1K-1), reached after heating at 280C, was founded in both Andisols, which have similar organic carbon content and a mineralogy dominated by allophane. A higher thermal conductivity value (about 0.67 Wm-1K-1) was obtained for the Ultisol with a lower organic carbon content and a mineralogy dominated by kaolinite. The heat transfer occurs through contact points in particulate material; thus, a better arrangement is attained when the mineralogy is dominated by crystalline compounds, which allows a better heat transfer. Furthermore, when organic carbon increases the thermal conductivity decreases (3); both factors, mineralogy and organic carbon content explain differences observed between Andisols and Ultisols. Thermal diffusivity varies upon the soil; in Collipulli soil decreases and in Diguillin soil increases with temperature; in Ralun soil is almost constant in all range of temperature. The volumetric heat capacity, calculated from thermal conductivity/thermal diffusivity ratio, will change as a function of both; in Andisols decreases with temperature while in the Ultisol is almost constant over all the range of temperatures considered. The thermal characterization of soils can be carried out by the hot disk method, with enough accuracy and sensitivity to temperature changes, if the heterogeneity of samples is considered. Thermal parameters depend on water content, organic carbon content, and mineralogy of samples. This study was supported by DICYT-USACH and Fondecyt M. Antilén acknowledges the financial supports provided by CONICYT to her graduate program.